I’ve finished putting the top together with all my string hearts – I love how it looks! I had some coordinates from Laura Ashley’s “Mod Floral” line (Quilting Treasures) which worked well with dark heart backgrounds. Setting the hearts in rows made it easy to compensate for any block size variation. Thanks to everyone who sent me blocks – I look forward to seeing how the other winners use theirs! Love how you have put this together. great colours. It's beautiful. I've been away for 3 weeks and just arrived home to a mailbox full of hearts. I am trying to decide how I will display mine. What fun! This turned out really nice! I never would have thought to do this with those blocks. Super! I really like the way you've created a criss-cross pattern with the dark background fabrics. I really noticed it when I was trying to use the computer without my glasses. Wow, this is so pretty. I am still trying to figure out what to do with mine. 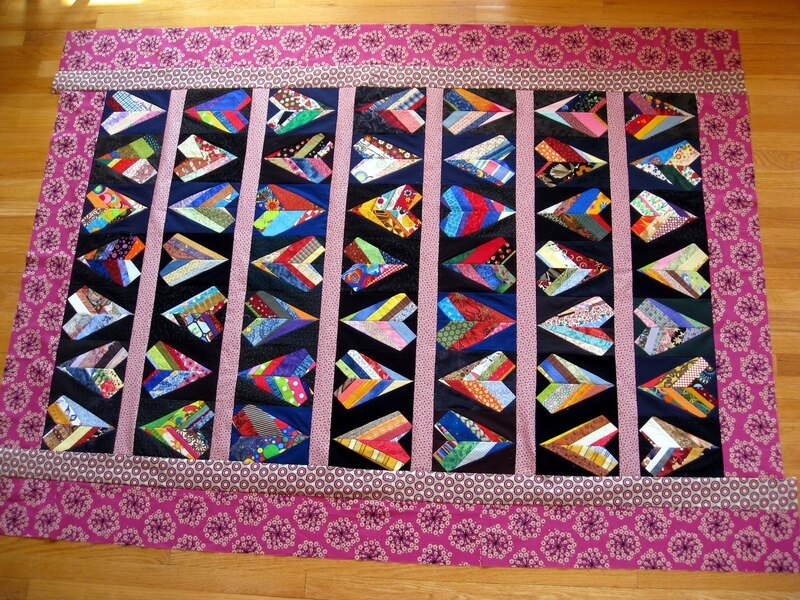 This is a beautiful quilt. Great work. That is really different and lovely. 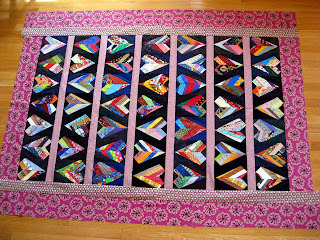 A unique quilt.